Harpies are one of the most common characters of different games of the RPG genre, such as Gothic of The Elder Scrolls. Harpy in ancient Greek mythology – is a bird-woman of a disgusting look, personification of various aspects of the storm. 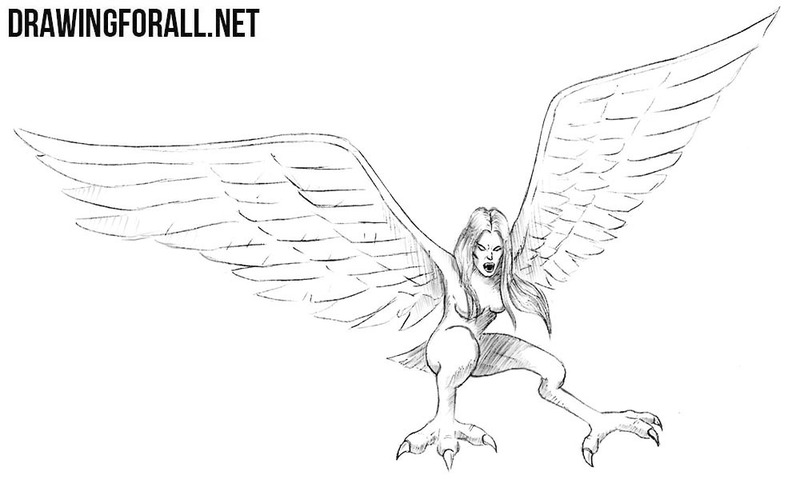 In this lesson we want to show you how to draw a harpy. First of all sketch out the head of the harpy in the form of an oval. Next, draw the spine, chest and pelvis. 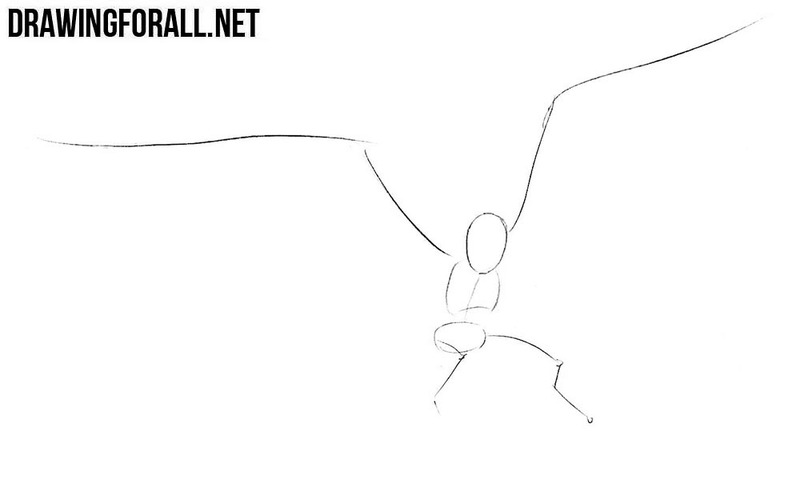 In the end of the step we draw the outlines of the legs and the long wings instead of the arms. Sketch out two lines on the head, which will help us draw the details of the face. Next, we draw the outlines of the lower edge of the wings. Next, carefully draw out the shape of the torso of large bird legs. Starting with this step we will draw the details. Draw out the eyes, nose and wide-open mouth of harpy with the help of intersecting lines from the previous step. With the help of long wavy lines draw out the hair of harpy. Next, we draw the shape of the torso, which tapers strongly in the area of the waist. We move even lower and draw out large enough legs of the harpy. 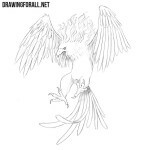 Carefully draw long fingers with sharp claws and feathered tail. Now let’s move on to the wings of harpy. Draw out the upper row of feathers with the help of clear and short lines. Draw two more rows of feathers on the wings. Note that the lower row of feathers should be the largest. 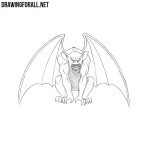 If your Harpy drawing is similar to ours, then go to drawing the shadows. 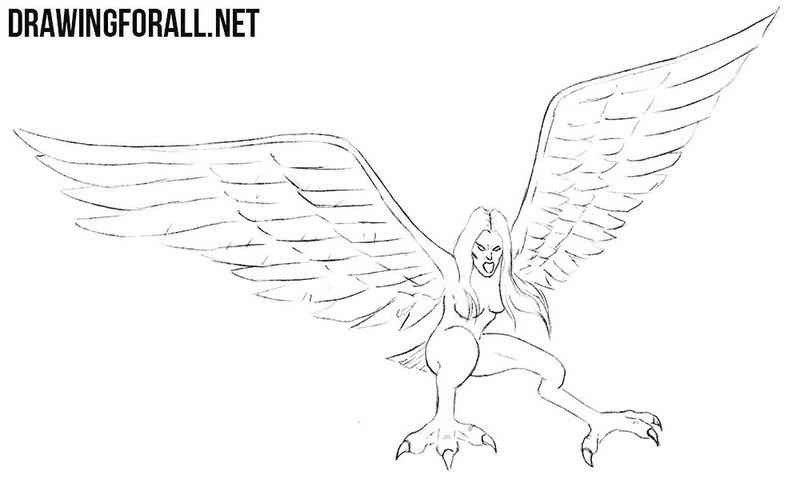 Using hatching of different intensity, draw shadows on the least illuminated areas of the body of the harpy. Also paint the hair of harpy as in our example. 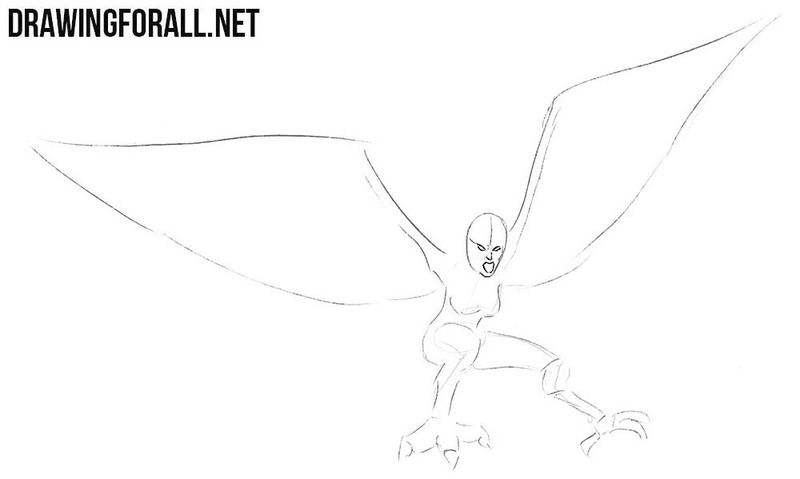 In this lesson we showed you how to draw a harpy. 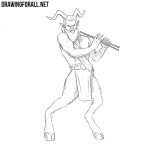 This terrible creature from the ancient Greek myths you could see in a variety of games, books and movies. 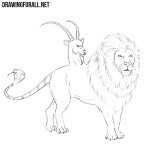 In the myths these creatures are represented as evil kidnappers of children and human souls. Harpies are one of the most ferocious and ugly characters in Greek mythology. But harpies are certainly not the only mythical creatures. 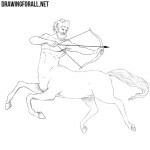 We want to draw a lot of other characters, and in order not to miss these drawing lessons, subscribe to us in social networks and visit our site as often as possible.